Is your blog social media- and mobile-friendly? If not, you could be losing out on loads of traffic. Columnist Jordan Kasteler explains how you can kick your content up a notch to get it in front of a larger audience. We live in an attachment society. Take a look around any coffee shop, restaurant, park or mall, and you’ll see people’s noses glued to their smartphone screens. These people aren’t making phone calls. They’re consuming content and interacting with the digital universe from just about anywhere. And it’s dangerous. Overuse of mobile devices is causing people’s sleep patterns to be disrupted, dizziness, headaches and so much more. Still, despite the dangers, people still use their smartphone religiously. As a business, this behavior is one to capitalize on. But if your company’s website and blog aren’t set up to be mobile- and social media-friendly, you could be missing out on some big-time traffic. More than half of Google searches are done from a mobile device. Nearly 900 million people access Facebook only via their smartphone. It’s clear there’s a convergence of search, social and mobile behaviors, so what can your business do to capitalize on it? Let’s dig in. First check: Is your blog mobile-friendly? Setting up a blog could change your business life — if it’s done right. In 2015, Google made another update to its ever-changing algorithm to accommodate the increasing number of mobile device users. Websites that weren’t mobile-friendly saw a steep decline in traffic and rankings. If you set up your blog using one of the many blog sites available, such as WordPress or Weebly, chances are your website is mobile-friendly. Still, it’s important to double-check. Some blogs or websites might not be mobile-friendly due to the theme they’re using. A mobile-friendly WordPress site or Weebly site that has a “responsive layout” has pages that respond and adjust to whichever device your reader is using, making it easier and more enjoyable to consume your content. Many companies opt to kick their mobile content up a notch by developing mobile apps. Mobile apps aren’t for every business, however. Creating an app exclusively to distribute content is a waste of time and money. Apps are ideal for businesses that want to solve unique business problems, such as tracking rewards points or checking account statuses. If your customers need to log into your website for any reason, having a mobile app is a good idea. 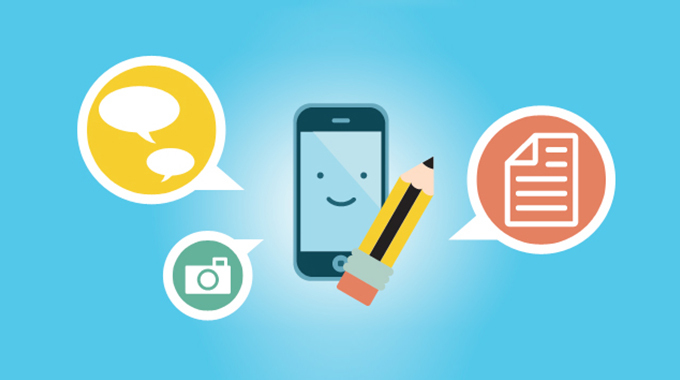 While developing your mobile app, it’s a good idea to have a spot for your content. You already have a targeted, captive audience, which means you have a prime opportunity to get your app users engaged with and talking about your business. If you’re distributing content via your mobile app, be sure you have a fast and easy way to share it. Include sharing links and buttons, or make it easy to copy and paste a link to the content on your website. The easier you make it, the more likely it is that your readers will spread the word about your business. As beneficial as apps can be in some businesses, the bulk of your blogging still happens on your website. Here are a few ways to make your blog stronger for the mobile and social reader. Google’s Accelerated Mobile Pages (AMP) feature is one of the best and most underutilized parts of the blogging world. The concept is simple: This Google-backed project gives publishers the ability to have their pages load faster on mobile devices. In turn, mobile readers have a better experience with your content. Google knows it, too. That’s why it’s continuing to include AMP websites in the search carousel (even though Google continues to deny that AMP pages will affect search engine rankings). If this looks complicated (and it does for a lot of bloggers), hiring remote developers might be the easiest and fastest way to ensure you’re set up with the AMP. Ever wonder how Facebook displays photos and videos so quickly? It seems to take no time at all to load these into its News Feed as users scroll through. Now, it’s using this same technology to load articles just as quickly. According to Facebook, these articles load 10 times as fast as mobile web articles and are 70 percent less likely to be abandoned by the reader. They’re also 30 percent more likely to get shared than standard mobile articles. You can start publishing Facebook instant articles by staking your claim as a publisher with Facebook. It’s a quick three-step process of signing up, submitting a few sample articles, and then publishing your Instant articles to the social media giant. Are you optimizing as well as you can for social and mobile readers? The way people are using the internet is changing. Google AMP and Facebook Instant Articles are just a couple of ways to get your blog in front of a larger audience. What are you doing to optimize your content for the social and mobile reader?